The Capitol Building, c. 1910. The corruption of the United States Congress by monied interests and its eclipse by the other branches of the federal government is a topic we regularly return to. It is not difficult to show that this has happened; more interesting is why it happened, and when. One of the best descriptions is provided by the noted sociologist C. Wright Mills. C. Wright Mills wrote his most famous work, The Power Elite, in 1953. Perhaps the greatest virtue of this attack on the 1950s "establishment" was the author's insistence that he present the data behind every claim he made. No Jeremiad against the 21st century 'power elite' has matched Mr. Mills on this point. "In the middle of the nineteenth century--between 1865 and 1881--only 19% of the men at the top of the government began their political career on the national level; but from 1901 to 1953, about one-third of the political elite began there, and, in the Eisenhower administration, some 42% started in politics at the national level--a high for the entire political history of the United States. From 1789 right up to 1921, generation after generation, the proportion of the political elite which has ever held local or state offices decreases from 93 to 69%. In the Eisenhower administration, it fell to 57%. Moreover, only 14% of this current group --and only about one quarter of earlier twentieth century politicians-- have ever served in any state legislature. In the Founding Father's generation of 1989-1801, 81% of the higher politicians had done so. There has also been a definite decline in the proportions of higher politicians who have ever sat in the United States House of Representatives or in the Senate. In 1801-25, 63% of the political elite had been politicians in the House, 39%, in the Senate; from 1865-1901 the proportions were 32 and 29%; but during the 1933-1953 era, only 23% had ever been members of the House of Representatives, 18% of the Senate. ....Once, most of the men who reached the political top got there because people elected them up the hierarchy of offices. Until 1901, well over half, and usually more than two thirds, of the political elite had been elected to all or most of their positions before reaching their highest national office. But of late, in a more administrative age, men became big politically because small groups of men, themselves elected, appointed them: only 25% of the higher politicians in 1933-53 rose largely by means of elective offices; 9% has as many appointed as elected offices, and 62% were appointed to all or most of their political jobs before reaching top position. " Increasing costs of campaign finance, the explosion of executive agency regulations, and the gargantuan size of modern legislation, all three common explanations for the legislature's decline, are given little space in Mill's account. This is because most of these trends only took off after The Power Elite was written. Yet as Mr. Mills' book suggests, the eclipse of Congress began well before any of these things. They did not create a new problem, but compounded what was already a serious one. T. Greer. "Separation of Powers is Dead." The Scholar's Stage. 14 March 2013. ---- "What Senator Paul Accomplished." The Scholar's Stage. 7 March 2013. ---- "A Few Thoughts on the Senate." The Scholar's Stage. 29 May 2010. ---- "Made by Washington: Ignorance and Hackery." The Scholar's Stage. 20 March 2010. Today, China is modernizing at an incredible clip, and the U.S. appears to be in decline. The technological balance is still in the West’s favor, but the situation is changing fast. Maybe it’s an awareness of this rapidly-changing status quo that’s motivating Western experts to urge Washington to contain China, and it seems that President Barack Obama is moving in this direction, even as his Republican rivals urge even more ambitious military buildups. I agree whole heartedly with this conclusion: there is a sore need for Western scholars, statesmen, and soldiers who are familiar with the Chinese strategic tradition. I speak from personal experience. With the 24 months of service as a missionary for the Church of Jesus Christ of Latter Day Saints excepted, throughout the last four years the most pressing of my varied intellectual pursuits has been an attempt to master the "Chinese military tradition" that Mr. Adrade speaks of. While this effort may bear fruit sometime in my professional future, the vast majority of my readings were unrelated to course work or vocational concerns. For no other reason than an irrational passion for the subject, I manage to read at least one book of Chinese philosophy, history, or strategy every month. Alas, this has not been enough. The central problem is that there is a great gap between the state of Western scholarship on the Chinese and Western military traditions. Only a few examples are needed to illustrate this point. 1. Western historians are quick to recognize that their civilization is indebted to the men of classical Greece, Rome, and late antiquity. The foundations of Chinese civilization were laid in its own classical era, commonly divided by historians into three parts: The Spring and Autumn Period (771-476 BC), the Era of the Warring States (475-221 BC), and the first true Chinese dynasties, the short lived Qin and the glorious Han (221 BC-220AD). 2. The Zuo Zhuan is one of the most important works of Chinese civilization. Sometimes translated as The Commentary of Zuo, the book is a narrative commentary upon the Spring and Autumn Annals, the official chronicle of the state of Lu during the period that shares its name. The Zuo Zhuan is the oldest narrative history in Chinese civilization and the main source for the period it covers - the period that produced both Confucius and Sunzi. More importantly, it was one of the "Five Classics" that formed the backbone of the Confucian curriculum that every learned man was supposed to master. Because the book provided a universal reference point for most of China's imperial history, there has hardly been a single debate over a dynasty's foreign policy that did not cite some precedent found in the Zuo Zhuan. For 2,000 years it's contents were an integral part of every single major strategic discussion. The last complete translation of the Zuo Zhuan into English was by James Legge. He published it in 1872. 3. No war has captured the imagination of the Eastern mind like that waged between the "Three Kingdoms" that rose from the ashes of the Han Dynasty's collapse. The travails and victories of Wei, Shu, and Wu have been told again and again throughout Chinese, Japanese, and Korean history. Their story has been told through many mediums. It first emerged in medieval shadow plays and Song dynasty operas, by the 15th century it was adapted into a historical novel that holds a similar place in the Chinese literary canon that plays like Julius Caesar and Richard III have in the West, while in the 21st century it has inspired a multi-billion dollar video game franchise, twenty different Japanese manga, two of the most ambitious Chinese television dramas to air on CCTV, and the most expensive Asian film (and the most lucrative) ever produced. Their words , names, and strategies have become household idioms. I have not met a single Chinese person who cannot relate stories about these legendary generals and statesmen. Famous conflicts of Western antiquity (such as the Peloponnesian or Punic Wars) receive scholarly and popular treatment several times a decade. In contrast, there has never been a political, military, or narrative history of the Three Kingdoms written in English. Scholars like Rafe de Crispingy have published scholarly monographs and biographies that significantly improve our understanding of the times, but these are not enough. This is the most celebrated conflict in all of human history! As far as the English speaking world is concerned, its history has never been told. Many more examples could be given, but I think the reader will agree that they are not necessary. The relative neglect of Chinese military and political history is made the worse by the nature of the scholarship that is published. For the uninitiated Chinese history proves a complex and confusing tangle of obscure places, names, and dynasties. This is not a problem unique to Chinese history; Robert Strassler created the Landmark Ancient Histories because he recognized that modern readers, not versed in the language or geography of the classics, had trouble making heads or tails of the complex conflicts of ancient Greece. But no matter how confusing modern Western readers may find the ancient Mediterranean world, they will at least have some frame of reference. Sparta, Syracuse, Carthage, and Gaul are recognizable to most readers; Qi, Chu, Luoyang, and Chang'an are not. There is no Landmark Ancient History series or Atlas of the Classical World for Chinese history and many of the maps found in translations or monographs are of a very poor quality. Chinese discourse, philosophical thought, and strategic treatises are filled to the brim with allusions to past ages, so it can be difficult to understand what is being said or argued without extensive knowledge of what went on before. Books written by sinologists often reference events, movements, philosophies, or schools of thought unknown to most Westerners without bothering to introduce or explain them to new readers. Figures in Chinese history often have more than one name or title, and historians are not always consistent in which ones they use. All of this is further complicated by the wide range of Romanization systems that have fallen in and out of favor during the last 100 years. Much of this is the fault of the sinologists themselves. Their work is expensive. It is not accessible to new comers. But the inward-looking nature of modern academia cannot account for all of this. If sinologists write books on Chinese history that only other sinologists can understand it is because experience has taught them that nobody but other sinologists are interested in the subject. My hope is that as public interest in China continues to grow and the disciplines of global history and comparative history progress this will change. Until then, becoming familiar with the Chinese military tradition is a lot like jumping into the deep end of a swimming pool. Once you decide you want to make the jump, you are guaranteed to be in over your head. I hope none of that discourages my readers. The way may be difficult, but it is worth it. I have learned just as much - if not more - from Sima Qian, Xunzi or the Seven Military Classics as I have from Thucydides or Plutarch. The Chinese military tradition is about more the People's Liberation Army - it is a window to 3,000 years of humanity history. Basic Writings of Mo Tzu, Hsun Tzu, and Han Fei Tzu translated by Burton Watson. 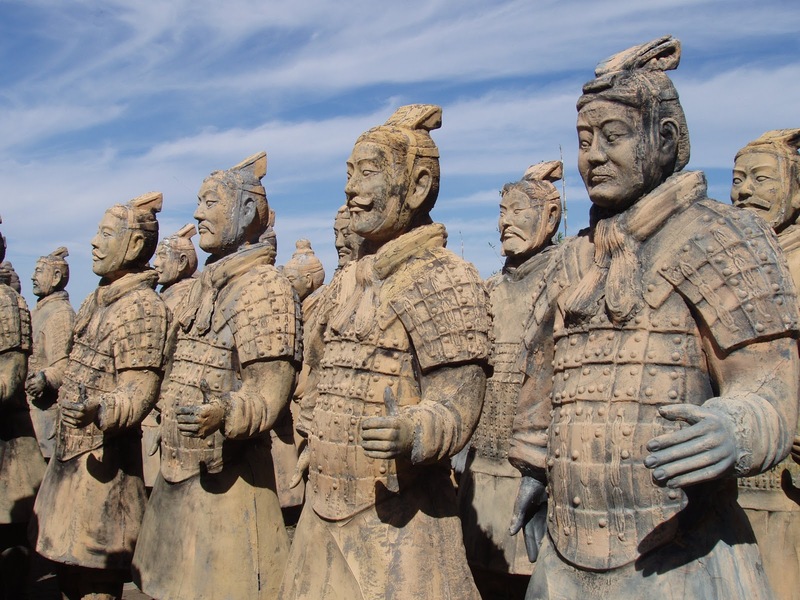 The Seven Military Classics of Ancient China translated by Ralph Sawyer. Records of the Grand Historian: Han Dynasty I by Sima Qian and translated by Burton Watson. Three Kingdoms: A Historical Novel by Luo Guanzhong and translated by Robert Moss. The Great Wall of China: From History to Myth by Arthur Waldron. Tonio Andrade. "The West's First War With China." The Diplomat. 8 February 2013. I believe that this process has already begun. Within this decade David Graff, Ralph Sawyer, Nicola di Cosmo, Peter Purdue, Timothy May, Kenneth Swope and Tony Andadre himself have all written books on various pre-modern Chinese wars. This decade has also seen a resurgence in the translation of Warring States political treatises. However, with the exception of William Nienhauser's (12 vol) translation of Sima Qian, few Chinese historical works have been translated. Political histories are also few and far between. How can America craft a new grand strategy? The example of Jia Yi - a famous Chinese statesman and thinker who failed to convince his dynasty to adopt the strategy he proposed - can help us understand the central role that culture and a sense of national mission play in the creation of national strategy. Jia Yi was a strategist born ahead of his time. 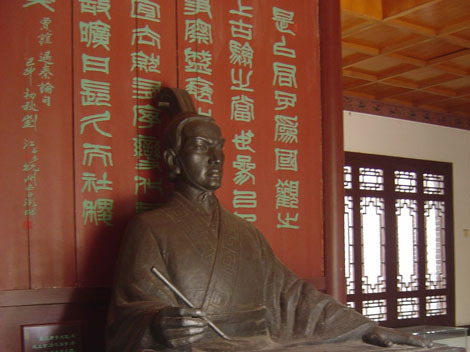 While not well known in the West, Jia Yi's ideas, poems, and petitions would influence Chinese thought throughout the millennia that followed his short life. Were it not for the monumental efforts of his near contemporary Sima Qian, it is likely that he would be known as the greatest thinker of his age. His was a day of great opportunity. He rose to prominence during the reign of Emperor Wen, a time when the Han Dynasty was still very young and even the obscure could reach great heights had they talent and ambition to do so. Jia Yi had both in spades; before his 22nd year the scholar had become part of the imperial court, where he penned many influential petitions on urgent matters of state. Jia Yi approached this task with a Confucian education and outlook. His writings place him firmly in Xunzi's "realist" branch of that tradition. This made him an outlier in the Emperor's court. The dominate philosophy of both the times and the court was Huang-Lao, a sort of 'applied Daoism' that counseled that "adaptation [should be] the guiding principle of the ruler" and emphasized restricting the scope of the imperial government and avoiding costly wars in order to bring about general prosperity. Jia Yi rejected much of this; he was an avowed critic of both the Han's foreign policy and the received wisdom it reflected. In a celebrated series of essays and memorials he would propose a set of policies designed to squelch internal dissension and assure the dynasty's dominance of "anywhere that boat or chariot could attain." It would be fair to call this comprehensive set of proposals a "grand strategy." Strategy is often described as the task of balancing ways, ends, and means. The "grand" ends Jia Yi sought to attain were heavily influenced by his Confucian world view. Nowhere is this more apparent than his discussion of the dynasty's relationship with the nomadic empire to their north, the Xiongnu. When Jia Yi began his imperial career, the Han had made peace with the Xiongnu through a treaty arrangement known as the Heqin. Under this system the Emperor of the Han and the tribal leader (Chanyu) of the Xiongnu recognized each other as brothers. Whenever a new Chanyu was chosen, the Han would send a royal "princess" (usually a concubine from the Emperor's harem) to be his wife, complimenting this endowment with annual "gifts" of treasure and silk. In return, the Xiongnu would not conduct armed forays into the empire. Confucian emphasis on hierarchy can seem a bit silly to those living in the 21st century, but it fit nicely with the wider contours of Confucian thought. Jia Yi and other men trained in the Confucian classics recognized that cruelty and caprice would lead to despots to power, but they also argued that such means could never keep it. If a dynasty came to control "all under Heaven" it was because it could bring prosperity to and perfect the natures of all who dwelt there. Confucians believed ritual (li) (and the hierarchies it imposed) to be the surest way to reach such perfection. If the dynasty failed to uphold li it was shirking the main reason (a "grand end", we could say) for its existence. Jia Yi's problem was that few others believed that this was a "grand end" worth pursuing. Most members of the court were not Confucians. They believed that the state which interfered the least governed best; their philosophy enshrined as sage those who adapted to the world's imperfections, not those who attempt to perfect them. Jia Yi's was a comprehensive plan to attain an ideal few others believed in; as a result his specific policy proposals (the "ways and means") were ignored. The young scholar, assigned to an outer province when one of his rivals gained favor in the court, feared that his ideas would never gain influence and fell into despair. He committed suicide at the age of 33. A grand strategy thus cannot be about setting the grand idea. Rather, strategy must be about what—or more importantly, who stands in the way of the idea becoming reality and how he or she can be made to accept it. American grand strategy should be a technical and instrumental assessment of the gap between a presumed future vision of the ordering of the social world and the present. It would abdicate the normative content of setting national aspirations to politicians and polemicists. Rather, the task of a grand strategist should be to delineate the ways and means necessary to use national power to accomplish the ideological consensus. The remit of the grand strategist’s reach would also be radically circumscribed. The problematic nature of the policy-strategy distinction means that a restrained grand strategy would still impinge on domestic politics. But its inherent clash with domestic politics would be nonetheless be substantially minimized down from the substantial domestic transformations American grand strategy demands today. "In Manifest Destiny and Mission in American History Frederick Merk states that the defining feature of the American polity has been its "sense of mission." Americans, says he, have always been invested in the idea that their Republic served a great purpose. They could never delegate their destiny to the realpoliticking of the upper echelons of power. In times of crisis it is this sense of of purpose that has sustained the Republic, and in achieving national goals it is this sense of purpose that has acted as the unconscious guide of American statesmen and citizens alike. Strip away America's mission, and you have stripped away America. And in doing so you have stripped away our grand strategy as well. Phrases like "Manifest Destiny" and "Arsenal of Democracy" were not merely the rhetorical flourish used by canny politicians to justify the exercise of power. They were the reason power was exercised in the first place. These phrases were, in essence, bit-sized distillations of the mission and purpose Americans claimed for their nation. Containment only worked because the American populace believed that it was America's mission to act as the Leader of the Free World. Cold War grand strategy was an outgrowth of this mission – a means to maintaining the mission's end. Purpose provides America with a vision. It prioritizes our interests, informs us of our enemies, and tells us what position we seek to hold on the international scene. A nation without a purpose is a nation without a grand strategy to achieve it. "America's problem is not that she has too many strategies, but that she has too many purposes. There is no consensus as to what America means or why America exists. There is no commonly held sense of purpose to unite the citizens of the Republic. And absence this sense of purpose, our strategists have no foundation upon which to build. As that last paragraph suggests, the folly with proposing 'big ideas' is not that they are unnecessary, for a sense of mission is prerequisite to the creation of any meaningful* grand strategy. Rather, the folly lies in the conceit that a policy wonk can dream up a national identity and then foist it upon the American people. Solidarity, purpose, identity are products of shared experience and shared narratives, not creations of upper class technocrats. Culture is molded, not created. To craft grand strategy absent an underlying unifying "big idea" is to figure the ways and means without a clear end. But if the idea is the strategist's alone, his designs will come to naught. This is the dilemma of American grand strategy. No American statesman or scholar can create a unifying sense of mission and purpose though his efforts alone, but until such a purpose is found no useful strategy can be made. Those who attempt otherwise will become an American Jia Yi. *Meaningful here designates any strategy with a greater purpose than than a simple bid for survival. Charles Theodore Sanft. Rule: A Study of Jia Yi's Xin Shu. (St. Paul, MN: self published). 2005. p. 12. e-book here. Charles Theodore Sanft. Rule: A Study of Jia Yi's Xin Shu. p. 288. Jia Yi is unlikely to have called himself a "Confucian", for this strand of thought was rarely recognized as a cohesive ideology that one could 'belongto' before the "five Confucian classics" became the foundation of the official system of education and the state began to sponsor temples in Confucius' name. However, everything from the sources he quotes to the arguments he employs rest squarely within this tradition. Columbia University's web-page "Confucius and the Confucian tradition" and University of Indiana's History G380 online course material"The Fortunes of the Confucianism in the Early Han" are two public domain documents that readers may also found useful. Adam Elkus. "Must American Strategy Be Grand?" Infinity Journal. Jan/Feb 2013. vol 1. Readers may also be interested in Mr. Elkus blog, Rethinking Security. T. Greer. "Dreaming Grand Strategy." The Scholar's Stage. 12 May 2010. I present the evidence for this assertion in T. Greer. "Manifest Destiny: A Case Study in National Purpose" The Scholar's Stage. 24 August 2010. T. Greer, "Dreaming Grand Strategy"
Burt Likko. League of Ordinary Gentleman. 15 March 2013. It would have taken someone, or a group of someones, with a substantial vision of what was going to happen after the dictator was taken out of the picture. The liberators were not those someones. Their whole plan was to put some steel in one guy as if he were the disease, and not just the symptom; once Caesar was gone, somehow things would just magically revert back to “normal,” a normal that hadn’t existed for a hundred years. The liberators did not think about institutions. They did not think about culture. They did not think about logistics. They did not think about government. They did not think about the contradiction inherent in a lawless act done in the name of preserving the law. They did not think about the immediate political aftermath. James Palmer. Aeon Magazine. 7 March 2013. There are a lot of cliches about Chinese society that are spread around by commentators who have not had many actual interactions with Chinese people. This essay is both a refreshing break from this tradition and a fantastic introduction to changing society of modern China. The older generation's worries about individualism and laziness are very real. I am reminded of an experience I had serving as a missionary for the Church of Jesus Christ of Latter Day Saints. Of the thousands of people I met over the course of those two years, one of the families I grew most attached to was a Chinese mother and daughter who had traveled to America so that the mother (who had a PHD in developmental psychology) could do some research with American colleagues. Religion in general is stamped out in mainland China, and unlike Western atheists jaded by the experiences with religion, the whole thing is rather mysterious and unknown to them. Almost all of the Chinese people I met had an insatiable curiosity as to how such an "irrational" activity could have such a hold on the Americans they interacted with every day. This mother was particularly taken by the devotion and service-driven lives of Mormon teenagers she encountered. She worried incessantly that her daughter – the only child of two only children, the sole focus of 3 generations – could not learn to serve others or think outside of her own narrow desires in China. She often admitted that much of her interest in having us visit the family was her hope that a belief in God might lead her daughter away from the selfish ethos of modern China; her first meaningful experience with prayer came when as she prayed for her daughter to have a desire to be a part of the Church. Brook Larmer. New York Times. 8 March 2013. People and Power. Al Jazeera. 21 February 2013. The blog ChinaSmack is another good resource for those seeking a more complete view of bailinghou society. Barry Riholtz. The Big Picture. 15 March 2013. "Fabius Maximus." Fabius Maximus blog. 13 March 2013. Both posts are jammed pack full of useful links. Walter Schneidal and Steven Frieson. Journal of Roman Studies. vol 99. November 2009. I tend to rely on Angus Maddison's historical statistics (see my sidebar) for historical data of this type. Mr. Schneidal and Fieson convincingly argue that Maddison and others underestimates per capita GDP of Empire, placing it at approximately $700 USD (1991). (Maddison in contrast, places it around $600). They also estimate the top 1% of Roman populace captured 16%-29% of the empire's annual income - a truly astonishing number when we realize that the resources they controlled were essentially static in nature. Unlike Maddison, they do not attempt to model the GDP per capita on a province-by-province basis. Al West. West's Meditations. 24 February 2013. Sir Humprhey. Thin Pinstriped Line. 1 March 2013. Chen Aisu. Reuters. 10 March 2013. "The accumulation of all powers, legislative, executive, and judiciary, in the same hands, whether of one, a few, or many, and whether hereditary, selfappointed, or elective, may justly be pronounced the very definition of tyranny." I ask my readers to pause for a moment and ponder this statement. It was penned by James Madison in 1788, published under the pseudonym "Publius" as part of Federalist Paper no. 47. Mr. Madison was an important framer of the United States constitution; along with Alexander Hamilton and John Jay he wrote the Federalist Papers to convince the American public that the constitution they helped create should be ratified as the Union's founding charter. This particular essay was directed against "the more respectable adversaries of this Constitution" who believed that it "[violated] the political maxim, that the legislative, executive, and judiciary departments ought to be separate and distinct." Were this claim true and "the federal Constitution, therefore, really chargeable with the accumulation of power, or with a mixture of powers, having a dangerous tendency to such an accumulation, no further arguments would be necessary to inspire a universal reprobation of the system." Consider what James Madison conceded in the introduction to his argument. If the form of government established by the constitution did not provide for the separation of powers, no other objections to the constitution would be needed. If the only flaw his adversaries could find in the constitution was that one of its three branches had "a dangerous tendency" to usurp power from its sisters, then every single argument proposed in the 46 preceding essays (to say nothing of the 40 that would follow) would mean nothing. If this charge could not be met then the new federal government would be the definition of tyranny. The constitutional balance so carefully framed by the members of the Constitutional Convention, defended by Mr. Madison so vigorously afterwords, and subsequently ratified by the 13 independent states of America is dead. The light of legislative branch waned as the 20th century progressed; the 21st century has seen it snuffed out completely. "On the issues of who should decide when and where to use force and for how long, and what our country’s long-term relations should consist of in the aftermath, Congress is mostly tolerated and frequently ignored. The few exceptions come when certain members are adamant in their determination to stop something from happening, but even then they do not truly participate in the shaping of policy. Despite years of combat in Iraq, the expenditure of hundreds of billions of dollars of national treasure and deep divisions that remained in the American body politic regarding our future role in this tumultuous region, over the period of more than a year during which the Iraqi SFA was negotiated and finalized, Congress was not consulted in any meaningful way. Once the document was finalized, Congress was not given an opportunity to debate the merits of the agreement, which was specifically designed to shape the structure of our long-term relations in Iraq. Nor, importantly, did the congressional leadership even ask to do so. Until finalized, the agreement was kept from public and media scrutiny, to minimize any debate that might have put it into jeopardy. From the overt and palpable body language of the executive branch, it was clear that opening up such an important and time-sensitive issue for congressional or public scrutiny would be counterproductive. When this writer asked to read the full document in the weeks before it was signed, I was required to do so inside a soundproof room normally reserved for reviewing classified materials, even though the proposed agreement was not itself classified. And from the logbook I signed before being able to read (but not copy or take with me) the agreement, it appears that I was the only member of the Senate who at least at that point had actually read it. Congress did not debate or vote on this agreement, which set U.S. policy toward an unstable regime in an unstable region of the world. By contrast, the Iraqi parliament voted on it twice. THE FAILURE of Congress to meet its historical obligations while the president unilaterally engaged in combat operations in Libya promises even deeper consequences for future crises. In many international situations the future promises a different kind of warfare, made possible (and politically more complex) by the use of special-operations forces, CIA operatives, drones and precision munitions, thus removing the average American from the consequences and even the direct knowledge of military actions that a president might undertake at his or her sole discretion. But to what extent should this “cleaner” way of war also remove Congress as an arbiter of when and where our nation should become involved in overseas hostilities? ....The issue in play in Libya was not simply whether the president should ask Congress for a declaration of war. Nor was it wholly about whether Obama violated the edicts of the War Powers Act, which in this writer’s view he clearly did. The issue that remains to be resolved is whether a president can unilaterally begin, and continue, a military campaign for reasons that he alone defines as meeting the demanding standards of a vital national interest worthy of risking American lives and expending billions of dollars of taxpayer money. ....In a world filled with cruelty, the question is not only how but whether a president should be allowed to pick and choose when and where to use military force on the basis of such a vague standard. Given our system of government, the fundamental question is: Who should decide? And even if a president should decide unilaterally on the basis of an overwhelming, vital national interest that requires immediate action, how long should that decision be honored, and to what lengths should our military go, before the matter comes under the proper scrutiny—and boundaries—of Congress? As a measure for evaluating future crises, it is useful to review the bidding that led to our actions in Libya. What did it look like when President Obama ordered our military into action in that country, and what has happened since? Was our country under attack, or under the threat of imminent attack? No. Was a clearly vital national interest at stake? No. Were we invoking the inherent right of self-defense as outlined in the UN Charter? No. Were we called upon by treaty commitments to come to the aid of an ally? No. Were we responding in kind to an attack on our forces elsewhere, as we did in the 1986 raids in Libya after American soldiers had been killed in a Berlin disco? No. Were we rescuing Americans in distress, as we did in Grenada in 1983? No. I recommend reading the whole thing. Former Senator Webb correctly notes that the SFA with Iraq and a similar arrangement with Afghanistan did more than just tip the scales of separated powers towards the executive - they were creations entirely independent of the framework set forth by the United States Constitution. "But that's the key issue - our small special forces teams are supported by a US conventional military infrastructure of precision strike capabilities that outmatches everything else in the world. Some of our smallest special operations forces have the firepower and capability equivalent to the entire military of some nations at their fingertip. There is nothing new about special forces, but there is a lot of new about featuring special forces operations as a primary instrument of State power. Do the old rules that govern use of military force apply sufficiently to global precision strike capabilities of platoon sized forces with brigade level firepower at their fingertips? Do we need new rule sets for the emerging predominance of special forces operations in our global military taskings? Will America have to wait for Murphy's Law to kick us between the legs before Congress decides to rethink how the emerging predominance of special forces operations influences existing laws regarding the use of military force globally? When these guys come home from Afghanistan, they are not going to be sent home to sit on the couch - they will be used, everywhere else. [Consider] the Senate Select Committee on Intelligence oversees intelligence activities. If in the conduct of its oversight it was concerned about a particular targeted killing practice, such as the criteria used to add someone to a kill-list, the committee could threaten to cut off funds until more information was provided about the kill-list criteria. However, it would not be much of a threat because appropriations are handled by the Senate Defense Appropriations Subcommittee, and there is little membership overlap between the two committees. This means that members of the Intelligence Committee overseeing targeted killings would need to enlist the support of members of the Appropriations Subcommittee to cut off funds. Here again, secrecy poses a problem because intelligence budgets are classified. Members of Congress serving on either the intelligence committees or the defense appropriations committees (which appropriates funds for intelligence activities) can access the budget, but even their security-cleared staff and other members cannot. In sum: The power of the legislature has been declining for decades. When C. Wright Mills wrote The Power Elite in 1956 he bemoaned the eclipse of that branch by the influence of corporate power and an ever-growing executive branch. He was correct to do so. Yet in his day no executive would have dared to agree to a treaty that was never presented to the Senate. The last two administrations have done that and more. This is our 21st century reality. Ours is a Republic that allows its executive branch to pursue strategies and wage wars that undermine the other branches of its government, and with them the constitutional checks placed upon it. The separation of powers is dead. We are left to wonder what James Madison would think. Jim Webb. "Congressional Abdication." National Interest. March/April 2013 Issue. Galhrann. 'With Great State Power Comes Greater Need For Oversight Responsibility." Information Dissemination. 7 March 2013. Gregory McNiel. "The Politics of Accountability for Targeted Killings." Lawfare Blog. 14 March 2013. C. Wright Mills. The Power Elite. (New York: Oxford University Press). 1956. p. 229-231, 248-269. Despite its age, I have not come across a better explanation for the legislature's demise than that found inside this book. I will repeat: I made a mistake. I will take this opportunity to explain both where I erred and to outline some basic facts essential to understanding the relationship between energy and economic growth. Lets start with energy efficiency. Everything we do requires energy. We conserve energy when we choose to not do something that requires energy (for example, deciding not to drive a car or turning off a flash light). We are more energy efficient when we manage do to those things using less energy than it would otherwise take (for example, retro-fitting the car of your engine to be more fuel efficient, or replacing the flashlight's incandescent bulb with an LED). If we wish to measure the energy efficiency of an entire economy, we use a measure known as energy intensity. Energy intensity is a measure of the amount of energy it takes to produce a dollar's worth of economic output, or conversely the amount of economic output that can be generated by one standardized unit of energy. Energy intensity varies widely from country to country; it is affected by a whole host of factors, ranging from climate to population density. However, most changes in energy intensity can be attributed to one of two things: technological change and structural change. If the steel industry discovers a new way to create a ton of steel with less energy than was required before, a technological change has occurred. If the steel industry outsources its factories and the workers that would have been on a factory floor are now employed in offices, a structural change has occurred. Many people believe that energy efficiency will be the solution to the world's energy problems. Increase energy efficiency, the argument goes, and you will reduce the amount of energy the world uses—that is, global energy consumption. This idea is intuitive. It is also false. It may be helpful to think about energy use and efficiency in a context more familiar than global economics. Think of it this way: if you bought a car with better fuel efficiency than your current one, would you use it more, or would you use it less? Sectors that use a lot of energy continue to do so even when they become more energy efficient for the same reasons most people drive more as their fuel costs shrink. Energy efficiency lowers the cost of production. This makes it possible to increase total production at a lower cost. As total production climbs, so does energy consumption. For this reason, decreases in energy intensity brought about because of technological change rarely reduce total energy consumption. To the contrary, decreasing energy intensity is often correlated with increasing energy consumption. 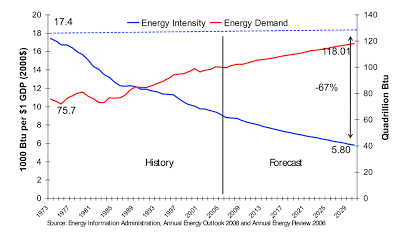 Energy intensity and demand for energy in the U.S. economy, 1973-2005. Source: Institute for Energy Research. "Is The U.S. Becoming More Energy Efficient?," webpage (2008). 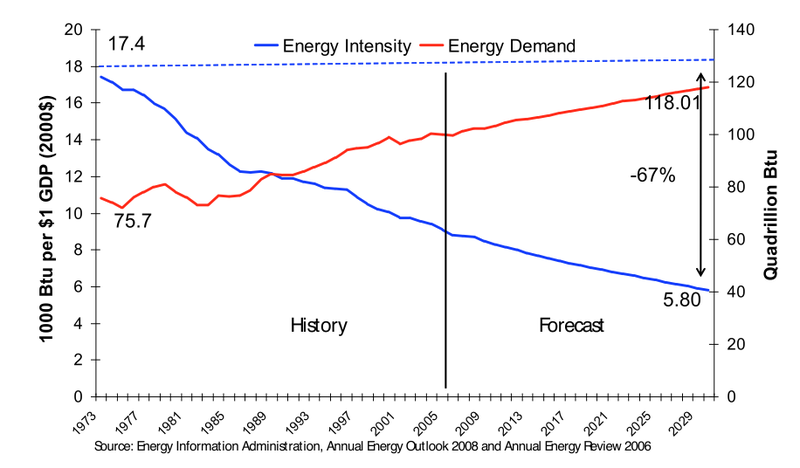 This logic (along with empirical evidence like the kind found in the graph above) form the foundation of the faulty statement that prompted this post: "History has shown that increases in energy efficiency lead to more energy consumption, not less." 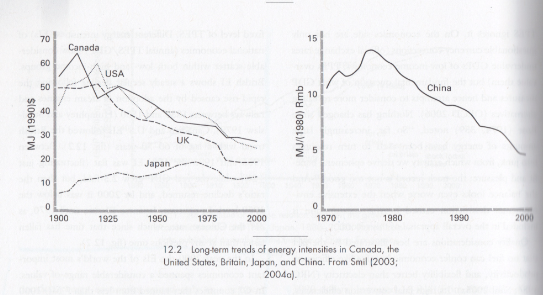 Trends in energy intensity for Japan, UK, USA, and Canada, 1900-2000, China, 1970-2000. From the late 1800s to 1925 America's energy intensity increased. From then until the 1950s it decreased, at which point it stayed relatively constant, decreasing again during the last fourth of the 20th century. In contrast, energy consumption (not pictured above) increased steadily across the entire period (with a few exceptions that will be discussed below). "History has shown that changes in energy efficiency had no historical correlation with changes in energy consumption." Source:Vaclav Smil, Energy in Nature and Society: Energetics of Complex Systems. (Cambridge, MA: MIT Press, 2008), 336. Source: Institute for Energy Research, "U.S. Consumption by Source v. Real GDP," webpage, (2008). Notice that in both the American and Japanese examples, the only times energy consumption fell were during periods of recession, depression, or stagnation—times when GDP growth fell or stalled as well. Why is GDP growth so tightly correlated with energy consumption? 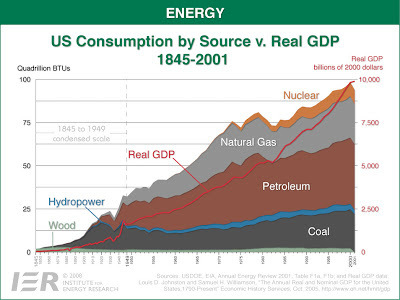 The answer: in many respects Gross Domestic Product is energy consumption. Every service and good in an economy is produced by using energy. "Wealth" is really just the word we use to name the goods created and services rendered through our energy use. Inasmuch as GDP purports to measure "The monetary value of all the finished goods and services produced within a country's borders"  it will inevitably reflect the amount of energy consumed to produce those goods and services. Tim Garret, "Is it Possible to Decouple Economic Wealth and From Carbon Dioxide Emissions?, Part I", Youtube video, 12:51, originally delivered as a lecture for the Pacific Institute for Climate Studies Seminar (31 May 2010). Part two is available here; part three can be found here. Those interested in the technical side of Mr. Garrett's presentation will want to read Garret's, "Are there basic physical constraints on future anthropogenic emissions of carbon dioxide?" Climate Change 104 (2011). Is It Really Possible to Decouple GDP Growth From Energy Growth? Gail Tverberg, Our Finite World (15 November 2011). Contains graphs (and discussion) of GDP growth and energy consumption for a dozen different countries, 1980-2010. David Stern, CCEP Working Paper 3.10 9October 2010). A technical review of the literature on this topic written by and for economists, but it sums up what we know right now. 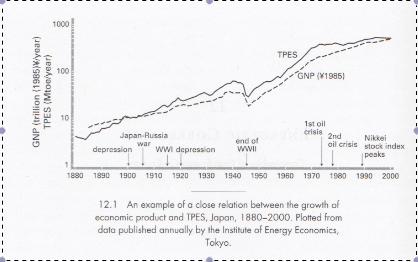 T. Greer, "The Recovery That Never Was: Energy, Debt, and the U.S. GDP," The Scholar's Stage (10 March 2013). Investopedia. "Gross Domestic Product - GDP" (accessed 13 March 2013).